If you are looking for a dream intown apartment in Chicago’s Gold Coast, you will love this beautifully restored Lake Shore Drive co-op, transformed under the discerning eye of Peggy Hommel Design. The one-bedroom gem, with a private entrance off the oak paneled lobby, boasts a gracious foyer, a living room with 10’ 6” ceilings, hardwood floors, and large new picture windows with bucolic views of Burton Place and a glimpse of the lake. The tasteful and sunny kitchen was fitted with ample storage, top-brand appliances and a breakfast bar. Modern conveniences include SpacePak air conditioning, a washer/dryer, and a built-in murphy bed for guests. While all draperies and light fixtures remain, the apartment may also be purchased completely furnished, excluding the art. 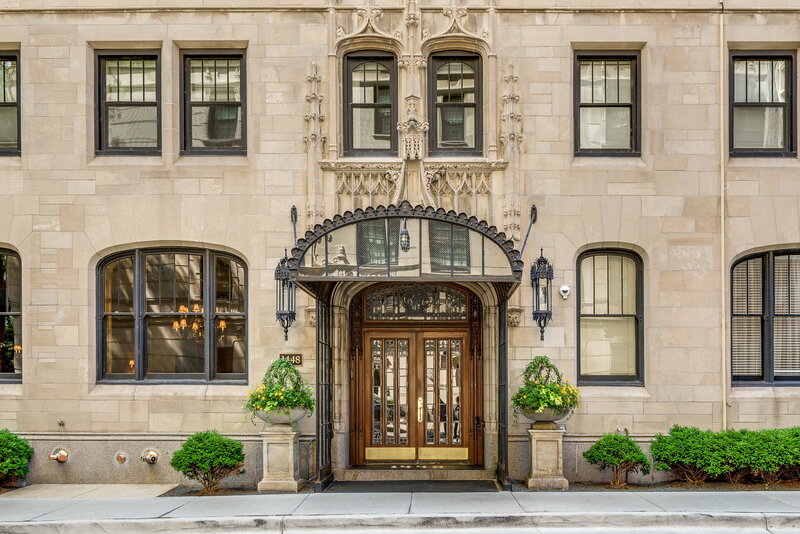 The monthly assessment includes the property taxes and leased garage parking options are available nearby.1448 N Lake Shore Drive, a luxury Gold Coast cooperative, was designed by Childs & Smith who were inspired by the painted decoration in the Château de Blois in the Loire Valley.